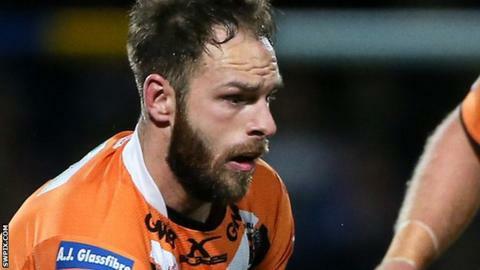 Castleford half-back Luke Gale gave evidence of his England qualities to inspire a fine victory over Super League leaders Leeds Rhinos. Gale scored two tries and kicked eight points to secure a Headingley double in 2015 and open up the race for top spot. Castleford let slip a 12-0 lead as the teams went in at half-time 16-16. But two second-half Tigers tries and a drop goal saw off Leeds, who will drop to second if Wigan win at St Helens on Friday. Rhinos lost captain Kevin Sinfield to a thigh injury early in the second half. England coach Steve McNamara will be looking at players for the three-Test series against New Zealand in November. Castleford started brightly, former Leeds academy player Gale crossing after a great line and pass by Grant Millington and then Denny Solomona taking in a Michael Shenton offload on the left to score. Luke Gale has played for the England Knights side, a team created to give players on the fringes of the senior squad an opportunity to impress, but is yet to make his full international bow. Tigers indiscipline led to the first try for Leeds, who used the field position to their benefit when Sinfield chipped to the left for Ryan Hall to touch down. McGuire made a break and clipped out to the left, where Mike McMeeken failed to gather and Joel Moon pounced. Hall got his second when he ran over Ashley Gibson to go in out wide and Luke Dorn finished off the first-half scoring from Gale's pass out wide, although there were claims of obstruction from the home support. Castleford repeated their first-half fireworks with a bright opening to the second period. Matt Cook outstripped the scrambling Leeds cover with a thunderous break before feeding Gale to race in, before teeing up Roberts with a cute pass. Leeds fought back as Cuthbertson battered his way over but Roberts' late drop-goal secured Castleford's victory. Leeds coach Brian McDermott told BBC Radio 5 live Sports Extra. "We're missing too many tackles and Castleford are noted for their attacking qualities, we need to turn that round. "We're probably not going to get League Leaders now, that's the disappointing thing now but the big fella [Super League trophy] at the end of the year is still to play for. "I trust the blokes, I trust we have the credentials and the minerals to front up and turn this round." We tend to be a bit frantic at times, we asked for a real defensive efforts and we dealt with their threats, we were superb defensively. We're growing as a team and a club, little things that have happened at the club have made things difficult and we've had injuries but we wanted to use this and the Wigan gamer as a lead to next season. We did that tonight, we showed a much better attitude and hopefully we can do that next week at Wigan. "Initially when I saw Michael Shenton's line I though the try would be called off but we've had a lot of tough calls, I decided a long time ago I'd just get on with it."